In my last post, I shared with you how I question my new clients prior to hosting a Roadmapping engagement. Today, I’m going to continue from where I left off and share with you an in-depth case study of a recent Roadmapping engagement of mine, including all the financials, proposal snippets, and more that I’m legally able to share without violating my non-disclosure agreement. 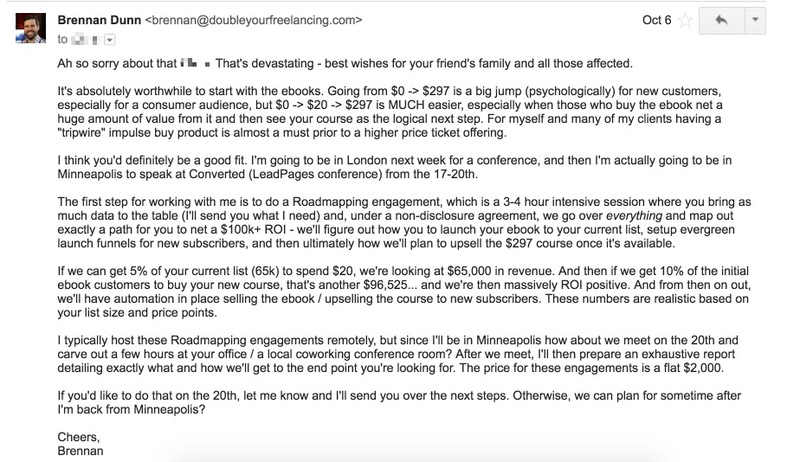 I get a lot of email from readers who understand the concepts behind Roadmapping, but aren’t exactly sure how to sell and host Roadmapping engagements with their clients. I also know most people learn best by example, so I’m hoping that this in-depth case study can help you get an idea of how to apply this practice to your own business. 1) Can you tell me a bit about the current state of your business. How do people find [REDACTED]? What’s your traffic/subscriber base makeup like? Ballpark weekly/monthly sales? The reason I ask is that before we schedule a Roadmapping session, I’m going to want to make sure that we have enough numbers to multiply to make an engagement worthwhile for you. 2) What business case led you to reach out to [REDACTED]? Are you mostly looking for someone to take work off you and your team’s plate, or are you looking to up your game in a way you’re unable to do so currently? 3) When are you looking to get started? 4) Typically my fully done-for-you engagements start at $20k when the projected ROI is $100k+ within the first year. For teams who are looking for more of an advisor and who plan on doing much of the implementation work themselves, I offer one-off or monthly options that start at $3,000. Which model best suits your needs? 5) What kind of marketing automation or website personalization work do you have in place now? I also give all of my clients a free copy of my course on Mastering Drip: https://doubleyourfreelancing.com/drip-course/ – I know you’re looking for more of a done-for-you service, but it’s a good resource to see what sort of things are available with tools like Drip. Once I hear back from you, I’ll send you over details about what the next steps would be. Before I get into her response, let me tell you a bit about why I asked what I did. I’m making it clear that I’m chiefly concerned about the underlying business problem. I want her to know that I’m investment-minded. I realize that she’s spending money and wanting to get out more than she’s putting in. I’m not asking for her budget, nor am I telling her what I charge. But by giving her ballparks about two classes of offerings that I provide — implementation and advisory — she’s getting an idea of what sort of budget would be required to hire me. This person has no idea that I run a 7-figure a year business that helps freelancers. Nor does she care. But one reason I created my course on Drip is because I know that pointing to the fact that I’ve literally created the course on the kind of work she needs done, I’m able to further solidify my expertise. Mostly importantly, she gave me the numbers I was looking for that I could accurately project what impact this project might have on her business. This allowed me to anchor the need for Roadmapping by stating that we’d need to go deeper into the numbers and her business in order to really chart a course for a six-figure payoff. After getting the go-ahead to move on to Roadmapping, I immediately sent over my Master Services Agreement (I include this in Double Your Freelancing Rate), a calendar invite for October 20th, and an invoice for $3,000. With a few weeks to go, I sent over an intake questionnaire via Google Docs. This gave my new client the time she and her team needed to crunch the numbers and provide me with as much information as possible to prepare me for the Roadmapping meeting so that we could plan the right path to succeeding with this project. Check out the questions I asked in this intake questionnaire here. I arrived at her office in the suburbs of Minneapolis with my laptop and a document titled “Immediate Goals That Will Make $$$” opened up. Prior to the meeting, I’d gone through their intake and poked around their site for a bit. What would I do to immediately improve their business, especially since I was now armed with all the numbers and figures that the world at large was oblivious to? If I only had a few weeks to really make an impact, what would I focus on? I don’t really pay much attention to what project scope the client brought to me. Because clients are often wrong, and I’m not afraid to tell them that. My goal isn’t to just do; my goal is to figure out WHAT to do. And that’s what I was thinking when I walked into their office on that blistery Minnesotan day. What would I do to grow this business? You know who wasn’t in that meeting? Brennan the web developer. Or Brennan the “Drip power user.” Or Brennan the writer of persuasive copy. I sat across the table from a fellow business owner, and we talked business. We talked about what made sense to do immediately, and what would have the biggest payoff. We talked more about their numbers. I asked for clarification about a lot of things. I wanted to pry and really figure out what assumptions she had, and why she had them. Why does she think doing this will yield that? Is she right? I don’t know… yet, but that’s why we’re here. What emerged was a project plan, prioritized and neatly packaged. But isn’t this stuff tricky? Talking business isn’t easy, right? Every single one of you reading this article is a business owner. Your clients are also business owners. So talk as peers. Always put yourself in the shoes of your clients. They’re probably spending money that they’d prefer spending on vacations or fancy cars on you. Ask yourself why they’re willing to part with their money. If you can show them that you respect that they’re using their money as a tool, and that you’re the lever that — when pulled — is going to make them more successful than they’ve ever been, you’re going to get the project. I knew walking out of that meeting that I won the project. Was it because I’m arrogant? Because I’m head-strong? Nope. Because I’ve walked out of meetings like that where I knew it was a lost cause, and I was OK with that. But I realized that she and I had planned out a money making machine. The next version of her business. It was now a question of liquidity: would she have the money in the bank to pay me? As I left for the day, I told her and the team that I’d next be sending over a Roadmapping report that summarized everything we’d discussed, and provided a clear plan of action for capturing this newfound opportunity. I use a proposal tool called Nusii, which provides a great interface for writing documents and getting buy-in from clients. “Why You’re Here” — What problem lies at the root of this project? “Where You Want To Be” — What does it mean to solve this problem? “What We Want To Do” — What paths are we proposing, and how do these options align with solving the problems of the client? “What We’ll Be Preparing For” — What can cause this project to fail, and how do we plan on overcoming these risks? “Why We’re Best For The Project” — What specific domain or business expertise do we have, ideally in the form of a case study, that demonstrates that we understand this problem and how to fix it? “How We Can Do This For You” — From the different paths we’ve propose, how do each of these satisfy the solution we’re aiming for, and what kind of ROI can the client expect from each option? More income independence. Right now, you’re doing a lot of outside events and negotiating with advertisers. The best thing about selling digital (and physical) products online is that you’re in control of the transaction, from beginning to end. There’s no middle-man. There’s no venue to deal with or travel to book. 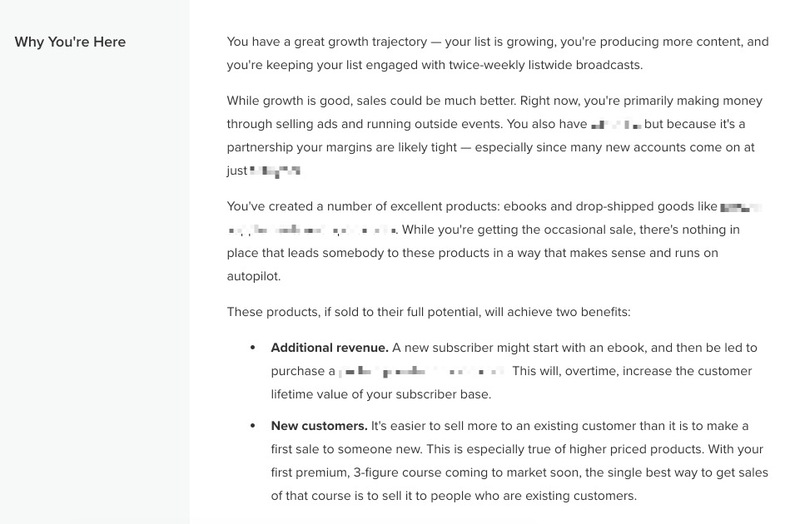 With your list size and growth, you should be able to easily bring in a few thousand dollars a week of product sales, and be able to compound that with automated up-sells and cross-sells to existing customers. More time independence. It can sometimes seem like you’re on a hamster wheel — always running new promotions, working on new deals, and so on to keep cash flow positive. Through smart automation and personalization, you’ll be able to delegate much of the ongoing work to automated systems. The client — the human being running this business — was tired of the partnerships and haphazard ad revenue that was currently paying her bills. She wanted income independence. She was also constantly needing to work, work, and work to stay afloat. But she’s running a business with tens of thousands of subscribers! She shouldn’t need to be so dependent on time as an input. It’s important to read between the lines when meeting with clients, especially during Roadmapping. I picked up on this, and I knew this was the REAL reason she was talking to me. She didn’t give a damn about Drip or automation or on-site personalization or any of the other things I threw out during our session. I always offer at least two options to my clients. Psychologically speaking, you want to offer your clients more than one option. It gives them more control, and allows them to choose the path that’s best for them. And it also allows you to anchor your pricing. $20,000 looks like peanuts up against a $50,000 option. Combined, the budget totaled $55,000 and it would take ~2 weeks of work to get everything setup. But I knew that if this was too much for the client, she could start with one and then queue up the other offer later. So this was a lot of money. $55,000 for around two weeks of work. I’d like to pay off the full engagement with just the ebook promotion to your entire list. If we email 60,000 people with a time limited offer to buy [REDACTED] for $19 (we’ll want to up the price to $29, and mention that there’s an accountability followup course attached to it), I think we’ll be able to get around 5% of those reached to buy — potentially more, especially if we’re able to personalize the sales page and pitch based on the needs and desires of your audience. This would net $57,000 in revenue, and would effectively pay for the engagement, and everything onward — the automation sequences that continue to pitch the ebook at $19, the January course launch, etc — would be pure profit. And automation is the gift that keeps on giving. What we do this year will still hum along in 2017, 2018, and beyond. Notice that I’m stepping back into the business owner role. That’s what I wanted to get across, and I did that by fusing my own experience with the numbers she’d given me before and during our Roadmapping engagement. I wanted her to accept this project right away. First, she’s in fitness, and everyone makes New Year resolutions related to their health. It would be silly not to have all this up and running before the new year. Second, I knew that excitement would wane as time went by. The emotional high she was on during our Roadmapping would start to level out. That’s another reason you should be Roadmapping. It’s a great way to get people around a table, whether in-person or virtual, and get excited about the opportunity available to the client. I’d like to get started on this immediately, if only so we can capture more net new customers, who are then more likely to ultimately buy your paid course. The single best way to get someone to buy a three-figure course is to get them to first buy a two-figure product. If we can start to hyper-segment your audience now and add 3,000+ new customers, the January launch will be even more successful. To get started, I’d create a Statement of Work detailing our engagement, and I’ll also get you setup on your own Client Portal, where you’ll get realtime access to everything I’m doing to help grow your business. I also require a deposit of 50% of the engagement cost, with the other half paid upon completion. I know that there’s a good chance that you don’t do the sort of work I do. If you want to, then I’d highly recommend stealing my secrets by investing in my course on Mastering Drip. But I encourage you to pull out a pad of paper and start thinking about how you could adapt this process to your business and the services you offer. I guess you could say that I’m a marketing consultant now. But I used to own a web development and design agency, and we applied these same strategies and tactics to our clients. Roadmapping is universally applicable, because Roadmapping allows you and your client to get on the same business wavelength, thus permitting you and them to work together to come up with the ideal plan of action. Good for you, and great for them.